JEE Main 2017 Notification Released. JEE Main Online Application 2017 and Exam Pattern, Exam Schedule and Syllabus provided here. In pursuance of Ministry of Human Resource Development, Government of India, Notification, the 5th Joint Entrance Examination (Main) - 2017 will be conducted on 02/04/2017 (Sunday) by the JEE Apex Board for admission to Undergraduate Engineering Programmes in NITs, IIITs and other Centrally Funded Technical Institutions etc. The online application start from 01st December, 2016 onwards. The States of Gujarat, Madhya Pradesh, Haryana, Uttarakhand, Nagaland & Odisha have joined JEE (Main) system. Therefore, the candidates seeking admission to the institutions in these states, which were earlier admitting based on their State level examination, are also advised to fill in the JEE (Main) -2017 application form online. 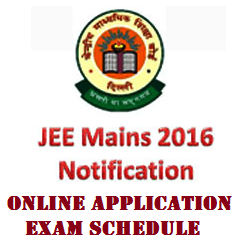 The detailed information bulletin containing details of examination, syllabus, eligibility criteria to appear, examination fee, cities of examination, State code of eligibility, age relaxation, eligibility for admission, reservation policies and important dates will be available on JEE (Main) website www.jeemain.nic.in on 01/12/2016. The aspiring candidates are requested to download the information bulletin from above mentioned website only and read the same carefully before applying. The eligibility criteria for JEE (Main) & JEE (Advanced) are different. The candidates are requested to read the information bulletin carefully and ensure their eligibility as per the criteria laid down for JEE (Main)and JEE (Advanced). The aspiring candidates have to apply online only through JEE (Main) website www.jeemain.nic.in. The online application process will start from 01st December, 2016 onwards. The last date for application is 02nd January, 2017 and fee can be paid upto 03rd January 2017. The aspiring candidate should furnish all the details and upload scanned image of his/her photograph, signature and left hand thumb impression in JPEG format only while filling up the ‘On-line’ Application. The candidates are required to take a print out of the computer generated acknowledgement slip after successful submission of data and payment of fee and keep the same in the safe custody for any future reference. Note: The candidate should mention only his/her own Mobile No. and E- Mail ID while submitting the ON-line application, as all the communications will be sent to the candidates on their registered Mobile Number and E-mail ID only.